Mercedes F. McCall is a well-known a banking industry and Hispanic business leader in the Central Florida community and currently serves as Sunshine Bank’s Vice President. In her role as Vice President, McCall is responsible for developing new client relationships and serving as a community ambassador. 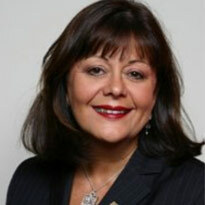 She is also well-known for her contributions to the Hispanic community in Central Florida, having served as the first female elected president of the Hispanic Chamber of Commerce, a founding member and past chair of the Hispanic Business Initiative Fund and a founding member of the Hispanic Scholarship Fund. A resident of Central for over four decades, McCall resides in Southwest Orange County near her only son, John Montenegro, and his family. She has been recognized among the 25 Most Influential Hispanics in Central Florida by Ahora Magazine; has received the Hispanic Women Lifetime Achievement Award from La Prensa newspaper; and has been named the Don Quixote Professional of the Year, among many other accolades.